The US Bureau of Land Management increased its fees on unpatented mining claims, mill sites and tunnel sites on federal public lands by about 10%, effective June 30, 2014, according to a story on Mineweb.com. 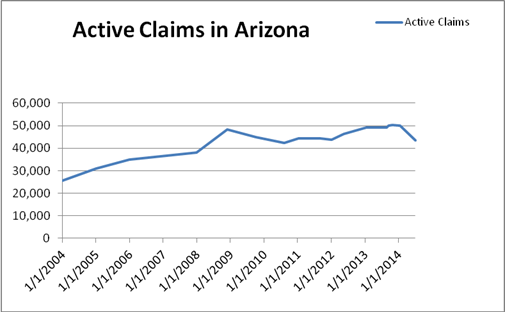 The number of Federal Mining Claims reported in Arizona today is 43,490, according to AZGS Economic Geologist Nyal Niemuth. There has been a big drop in lode claims from 40,018 to 34,632 since Jan 17, the last time we queried the total. The total number then was 49,991. Nyal thinks the drop is a result of uranium claims on the Colorado Plateau being dropped. The 10 year trend is shown in the figure above. Location Fee has increased from $34 to $37. All monies are due at the time of filing. A claim will not be accepted unless the payment of the maintenance and locations fees is submitted. The initial $155 maintenance fee is due for the assessment year in which the claim is located (not recorded). This fee is not prorated. Mining claim holders must now pay the new location and maintenance fees for any mining claim or site located on or after September 1, 2014, according to the Federal Register. Mining claimants must also pay the new maintenance fee for existing mining claims and sites to maintain those claims and site, beginning with the 2015 assessment year. However, all maintenance fees must be paid in advance for the upcoming 2015 assessment year. All Federal mining claims for locatable minerals are filed with BLM, part of Dept of Interior. The Forest Service (Dept. of Agriculture) generally does not own the minerals under the surface it manages. By agreement BLM allows Forest Service to manage the surface impacts of mining within Forest Service areas. Thus, the Forest Service approves plans of operations, etc. for mining claims. Glad to see the Mining Claims are still existing in Arizona. They may be declining but far from extinct. Amateur Rockhound and Geode hunting are alive and well.